When I spoke with Glory Edim, founder of the Well-Read Black Girl book club and author of the new anthology of the same name, she was in a library phone booth stealing time out of a hectic press schedule to chat with me about her journey. Recently released, her book brings together a dream team of black women writers to reflect on representation, black girlhood, and seeing oneself in the world. “The responsibility of a writer representing an oppressed people is to make revolution irresistible,” said Toni Cade Bambara in 1976. It’s a sentiment that women working in the black feminist literary tradition understand intimately, making it a fitting guiding ethos for Glory Edim’s second annual Well-Read Black Girl Fest. Following in the footsteps of Alice Walker, Audre Lorde, Lorraine Hansberry, Toni Morrison, and countless others, Edim’s book club has created a space for black women to engage with each other about their experiences while looking both forward and back in their own history. Selections include everything from Imani Perry’s Looking For Lorraine, which attempts to preserve, commemorate, and grapple with the legacy of a literary foremother, to Tomi Adeyemi’s Children of Blood and Bone, a young adult fantasy novel that finds creative ways to explore contemporary social issues. It’s hardly a surprise, then, that Edim’s new anthology continues in the same vein. With contributions from women like Jesmyn Ward, Rebecca Walker, Tayari Jones, Zinzi Clemmons, and Lynn Nottage, as well as an introduction from Edim herself, the book weaves parallel narratives of acceptance, representation, and discovery by collecting these women’s stories in one place. Well-Read Black Girl is an expressly political venue, and Edim’s values can be felt throughout; reading is activism, black lives matter, and trans women must be protected. 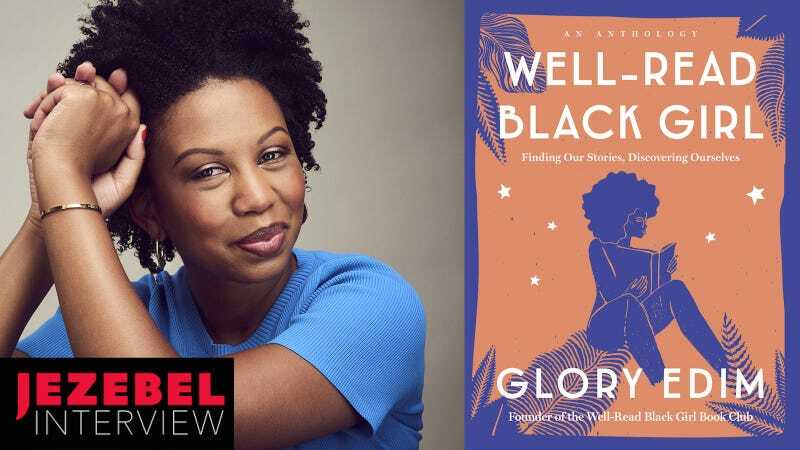 I spoke with Glory about her book club Well-Read Black Girl, the new anthology, and the impact she hopes to have on the stories we tell about black women. Our lightly edited and condensed conversation below. JEZEBEL: You write in the anthology that the idea for Well-Read Black Girl started after your partner gave you a t-shirt with the phrase on it. What about that moment galvanized you to want to start the book club and reach out to other black women through books? GLORY EDIM: When my partner made me the shirt, my first reaction was a sense of joy that he knew me so well. But it wasn’t until I started wearing the shirt out in public that it started to spark these conversations with black women in particular, where we would suddenly be talking in the subway for 15 minutes about Toni Morrison, or the last time we read black women authors. It happened more times than I could count, and it was really that that made me want to start the book club, the newsletter, and the Instagram, because it felt like such a special moment I was sharing with strangers. I just thought, what if I was intentional about creating that space with other women and really sat down and thought about it what could it be? If I was having so much fun connecting with people on an organic level on the A train, what happens if I really put some effort into it? The shirt was just a beautiful and thoughtful gift from my partner, but he also gifted me the fortitude to express this idea and start these conversations in the first place. One of the themes I saw recurring throughout is the issue of representation. Many of the writers talk about feeling like they’d been “given permission” to write only after seeing their lives reflected in books. Why did you choose to invite other writers to tell their stories in an anthology instead of simply telling your own? Well, I thought it was so important for this to be a multitude of different voices, and I wanted it to be intergenerational and to have a sense of conversation. I wanted the reader to feel like they were in conversation with the author and that they were discovering something new about their life, but also about what it means to be a writer. I also hoped it would inspire people to tell their own stories and pull out their own literary memories of when they first saw themselves. Seeing yourself doesn’t have to be a literal reflection (though in this case, we are talking about black women). There’s so many ways to see yourself reflected, and that’s what I was yearning for in the collection. Having all those different voices was vital for it to be successful. My story is one thing, but the community of Well-Read Black Girl is all of our stories. The essays read to me as journeys into womanhood and what it means to build one’s identity. Each of the book’s sections opens with recommendations for books for different moods. Why did you structure the book this way? I was really thinking about whoever picked up the book, whether it was a young black woman or a Latino man, could use it as a resource. So my goal was to have a full list of reading recommendations to help you reimagine what the literary landscape looks like and think about the stories and the black women who have written them. It spans from YA books to science fiction to playwrights to black feminism; it has everything. There shouldn’t be an educator who ever says, “I don’t know what books to read by black women.” If you pick up this book, you have a full list. Quite honestly, I wanted to put in more. There’s so much more that I could have listed, but there’s only so much room in my one book. I just wanted it to really show the power of black female identity in literature and how it does touch every genre. I also wanted it to really encourage analysis of our work. There’s the beauty and the emotion behind the stories but there’s also the craft of storytelling, and everyone in this book is a master storyteller. I really wanted it to be a resource for the reader to redesign their bookshelf. As I read the book, one of the things I kept coming back to is the idea that black women have to write themselves into the world because it often erases us. How do you hope that Well-Read Black Girl contributes to making black women seen? Oh, that’s a great question. I hope the community continues to inspire women to write and to be unapologetic about who they are and to have immense pride for their history and their heritage. I think it’s a powerful statement to declare yourself a writer. Writers have the ability to tell the stories. They tell us who we are and who we’re becoming. I was really taken by N. K. Jemisin’s essay “Dreaming Awake,” because she talks about ancestry and how in the past you’re looking to see yourself and be validated in so many ways, but we don’t have to rely on the literary canon to define ourselves, because we have each other. I feel really honoured and proud to be part of that legacy and to push forward that black women are beautiful in every aspect. With our writing, with our creativity, our strength. I think I’m even more sensitive to this because it happened unexpectedly. It’s not something that I sat down and created with a business plan. It really was a book club. Social media really pushed it in a whole other direction and I’m proud that it remains community driven and it’s really about all our own origin stories, who we are as black women and who we are in publishing. It feels right now like a renaissance, too, because 2018 is such a tumultuous time that we need spaces of inspiration, and we need to be able to cultivate these spaces without feeling fearful, which is another thing that makes this so special. For our generation, it feels even more vital to be in communion with each other. I’m really fascinated with the Instagram account, specifically because you’ve made it this home for books on a platform that is photo based rather than text based. I was surprised the newsletter came later. What made you gravitate towards Instagram when you started and why was it important to you to make the faces behind the books visible? The instagram really does serve as my personal inspiration board. A lot of the books and quotes existed in my journals before they were on Instagram. It was important to me to have a visual space where we could pay homage to the words of the authors that came before us. Because I went to Howard University, I have such a reverence for black excellence. In a lot of ways, I was trying to replicate the feeling I had from being around black people who are well-read and artistically immensely talented. There’s such a richness in who we are and how we move in the world, and I try to capture that in the photos. Inherently it’s a positive light on who we are in the literary space and the memories that make us who we are. This is what it means to be a black woman. This is the joy that we have. These are the books that we read. And it’s one thing to pay homage to the women that have come before us, but the essence of the book club is to always highlight a new debut author. This is the first time in the world they’ve published a book, and it’s a vulnerable time. That’s when you need everyone rallying around you and congratulating you and buying your book and coming to your signings. We’re paying tribute to the past generations of writers, but we’re always looking forward to the writers of today that are vibrant and deserve the recognition, too. We’re gonna pay tribute to the black radical tradition as the platform grows and my visibility grows. I’m very thoughtful about what we’re reading and how we’re reading together, because the goal is to continue to have spaces for these conversations. I’m always thinking about the reader experience and what they will take away from it. Because being black in America is inherently a political act, the project has a very political tone. Did you anticipate that when you started Well-Read Black Girl or did you embrace it later as the platform expanded? Do you ever feel overwhelmed by that? Do you ever just want to read some books without that baggage? [laughs] Yes and no. I’m a political person, so I have a lot of strong beliefs, because I am a black woman. When I originally started the book club, I was not slating my political leanings into the book selections, but now the selections do have a political leaning and energy towards them because of the political landscape. I don’t think we can afford to ignore what’s happening. But when this started three years ago, I wasn’t thinking about that. I was just thinking about enjoying the books together, and it felt very leisurely almost. But as it’s grown, my mission has changed. I really do think the personal is political, and we can’t ignore the landscape. As a black woman, my position is to be rooted in political and gender equality and to really understand and analyse the meaning of what we’re writing. There’s just too much happening right now for anyone to ignore or to not be intentional about our choices. I consider myself a black feminist, and a womanist, and all the books I’m reading and the things I choose to highlight reflect that. I don’t think I’m blatant about it, but if you join the community and participate, then it’s very clear. How do you work to make sure that Well-Read Black Girl is an inclusive space through books? I think it’s again in the book selections and with the community and the people I work with to be in collaboration and give people space. That’s essential. I’m not doing this alone. Well-Read Black Girl is not just me, it’s a community. So I do ask the community to be involved and I feel that it’s a privilege that people trust me to curate and I take the responsibility very seriously. You mentioned that your politics are clear and that you consider yourself a black feminist. Many of the writers in the book are also public feminists. Are you surprised by how inextricable literature and feminism seem to be for black women? You know, I’m not surprised. What we are experiencing as black women is not new. It’s so much of the same and literature is part of that; revealing and promoting and giving us agency. Writing down our stories is essential to that. It allows us to be more emboldened and powerful, and it’s a tool for us to feel and see and do all the things that are necessary for our survival and for our existence. The women who came before us broke boundaries and they were often the first to do it, and scholarship is key to that. It’s a continuum and literature and black art is at the center of that, and it allows other generations to look back and see their stories. Our conversation brings to mind the Cite Black Women movement and the idea that even when black women do the work, it gets erased. Is making sure that doesn’t happen part of your mission? Is there a mechanism by which you hope to preserve the legacy of black women writers? Yes! That’s one of the reasons I wanted to have a tangible, physical book and was very excited to create the anthology because I wanted it to be archived in a physical space. I appreciate our digital space and how beautiful it is that it is still flourishing but I was born in the 80s, [chuckles] and it was important to have a physical book and hold it, and that’s part of archiving—so it can be in a library and sit on a shelf. That’s why I love Cite Black Women, because they have such an incredible energy to encourage us to really look at scholarship and what it means to be in communities and recognize one another and really being collaborative. Part of Well-Read Black Girl’s mission is to keep black women writers at the forefront and as the team continues to grow we’re figuring out how to do that. Toni Morrison recurs frequently as an influence throughout the book. Were you surprised that so many of the women referenced her specifically? Yes! I was slightly concerned that everyone would write about her because she is the Queen Mother. But that didn’t happen. They reference her but they told stories about how her work influenced their craft and spurred new ideas for them. It didn’t become the Toni Morrison anthology. I mean, honestly, that would have been amazing, too, but it did have a range to it, and it critiqued her work as well. It allowed us to pay tribute to her and show how she was so essential to the lives of so many black women, and I think it was beautiful. My prayer is that she reads and enjoys the books and she feels that it is something that is dear to her and she feels that we are honoring her and her legacy. And what are the plans for Well-Read Black Girl moving forward? Will we be getting new books? I would love to continue to work on more anthologies that look at the craft behind black women and do a Q+A series. I’m also working on a memoir right now about my experience with my mom and our relationship through reading. I want to continue to build out the festival and continue to be an annual event. I like to think of it as our black family reunion, where we all come together to talk about books and art. In my mind, this feels like a mix of luck and opportunity and I’m still surprised by it, but I also know I’m a very disciplined person and I have a level of endurance, as well. Now that I’m working on my book, I’m thinking about what my legacy is going to be. So often I’m looking at the legacies of other women, and now I’m building my own. With everything that’s happened in the last three years, I’m curious as to how influential Well-Read Black Girl is in the literary space. Do you think you hold sway when it comes to conversations about new and emerging authors? I really believe that I’m in the beginning of my career, and I’m learning about publishing and the hierarchy of it as I move forward, and I’m trying to understand the power that I do have. Because I feel like power is tied to actually being able to execute things. Things like the festival and even the anthology I’ve been able to execute effectively, but what I want is to be able to help more black women be published—and not just published, but be best sellers and be powerful representations of who we can be in the publishing industry. So I feel like the next step is possibly having an imprint of my own and working with writers and fellow editors in that way. Perceived power is interesting because of Instagram. People assume because you have a lot of visibility that might equate to power, but that’s not necessarily true. I’m still learning so much in this process. When someone approaches me and asks me how to get an agent and I’m actually able to help them? That to me feels like power and influence in a way that I want to possess. And I feel like it is moving in that direction, but there is still a lot I have to learn. I know when I need help and when I need to rely on other black women to help me to get to that point. And I’m always recognizing that I’m not the first black woman to start a book club. Because this opportunity has been bestowed upon me I do feel a responsibility to help other black women achieve their goals and have the same success. Cuz it’s books right? Do we really want to be fighting over books? I don’t think that’s a space that we need to be in competition. Everyone can tell their story and everyone should have access to these opportunities and I try my best to make that happen with the resources that I have.